I am really excited to be a part of my friend Chris’ blog hop this week. Chris (Just a Girl) and I have been friends for years and she is a very special part of my life. I love that she asked us to focus on one room this year. As you know, I did not switch up my Christmas decor so it may look a bit familiar. 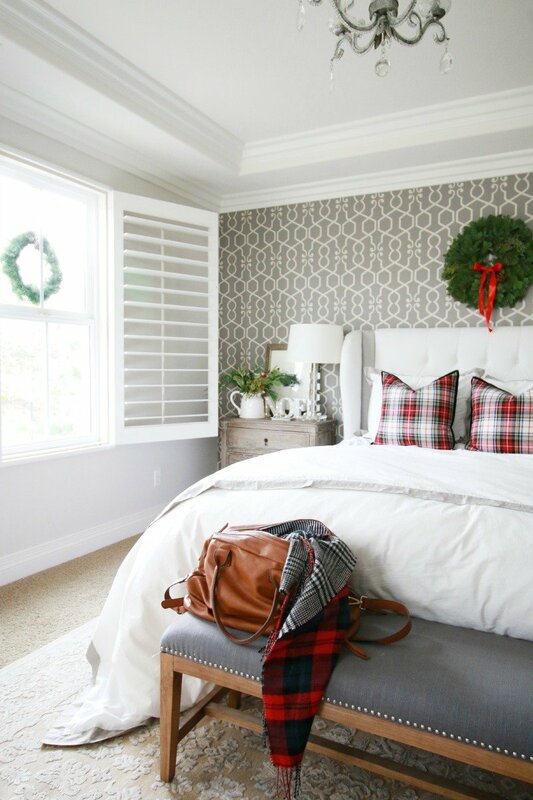 One of our favorite rooms this time of year is our bedroom. 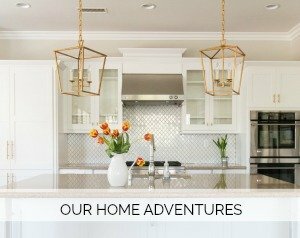 We only add a few touches but it makes it such a special retreat during this hectic season. So grab a hot cocoa or coffee and enjoy the tour. And if you are joining from Southern Hospitality, welcome! I am a sucker for plaid. I found these at HomeGoods last year and just love them. They add just enough color to our room this time of year. Our duvets are from Crane and Canopy (this one and this one) and we have been really happy with them. The Noel sign was a gift from my dear friend, Cyndi. I just love it. It’s even prettier at night. The nightstands are from Restoration Hardware. So we had a beautiful linen colored chair in here. Some of you may remember from last year’s tour. Well, when we redesigned our son’s room during the One Room Challenge, we could not find the perfect chair. Then we realized we already owned it and decided to give it to him. We miss it! But he loves it and that’s sort of awesome. So in the meantime, we borrowed this very uncomfortable chair from our playroom. We will be looking for its replacement in the new year. If you are new to A Thoughtful Place, the numbers on the wall are the dates of my children’s birthdays. My travel bag (which we are currently packing for a getaway is from here). I really tried to use a lot of fresh greens this year. 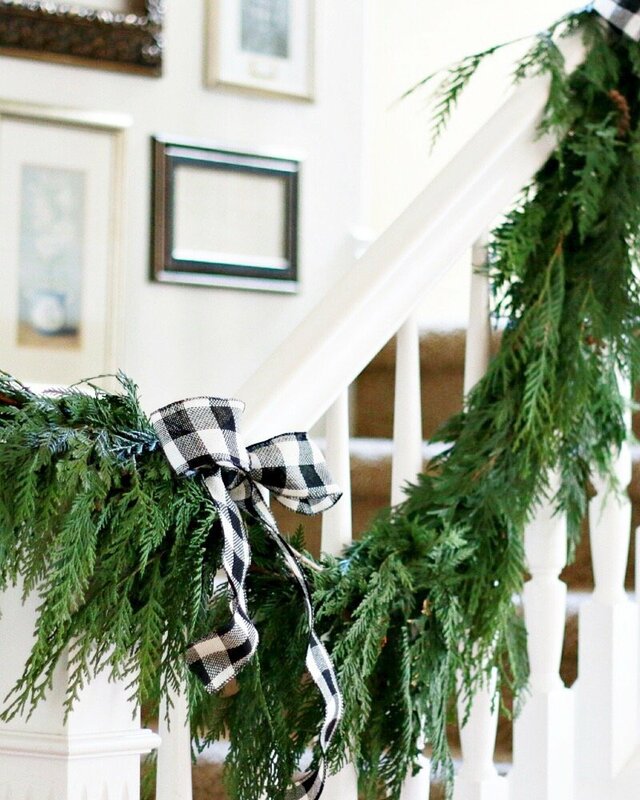 We have a few fresh wreaths hanging around the house and a fresh garland on our stairs. I love the smell and here is a little trick. . . if you garland gets dry, give it a cold bath for about 20 minutes. Allow it to dry naturally for 2-3 hours and rehang. It will give you a few more days which may be all you need if you are entertaining and want to give it more life. You can see our family room decked out for Christmas, too. I shared some traditions we hold near and dear. We have kept things pretty simple and traditional this year. 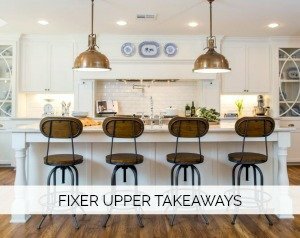 Now head over to see Janna at Yellow Prairie Interiors. She pretty much has my dream sliding barn door in her beautiful kitchen. It’s the most amazing wall complete with a chalkboard. 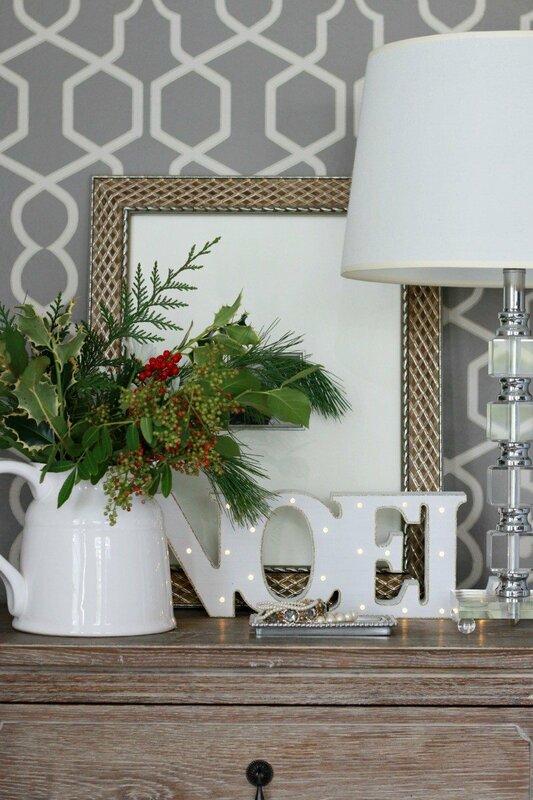 And I’m sure you’ll fall in love with her Christmas Room Tour. And thank you again to Chris for hosting. And if you catch up with me on Instagram you will have seen that my laptop died. It was tragic and altogether a bit of a fire hazard. In any event, I am still learning how to use my new one so that explains the lack of posting! Hoping to spend some time getting to know it much better this weekend. 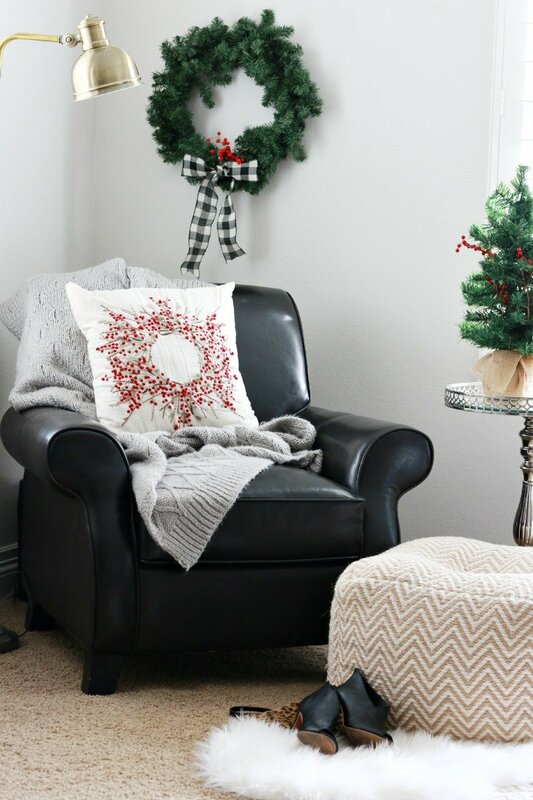 Everything looks so lovely…I adore those plaid pillows, and am cuckoo over that checked ribbon! I’ve done striped ribbon two years in a row, but feel a change coming for next year! (Yes, I’m talking about Christmas 2016 #nuttybloggers) 🙂 And such a bummer about your laptop…hope you adjust to the new one quickly, techy stuff is just the pits! Beautiful and not overdone… I love it! I love the plaid in your bedroom. My theme was plaid this year so I was so curious to see how you used it. I didn’t do my room and my goal is to incorporate Christmas decor next year in the guest room and my bedroom. We don’t have a Home Goods, but we do have TJ Maxx. I guess it will have to do. I hope your son is still enjoying his new room. Love the plaid. We used it throughout our home this year. Finally got pics posted yesterday. Your room looks really pretty Courtney. 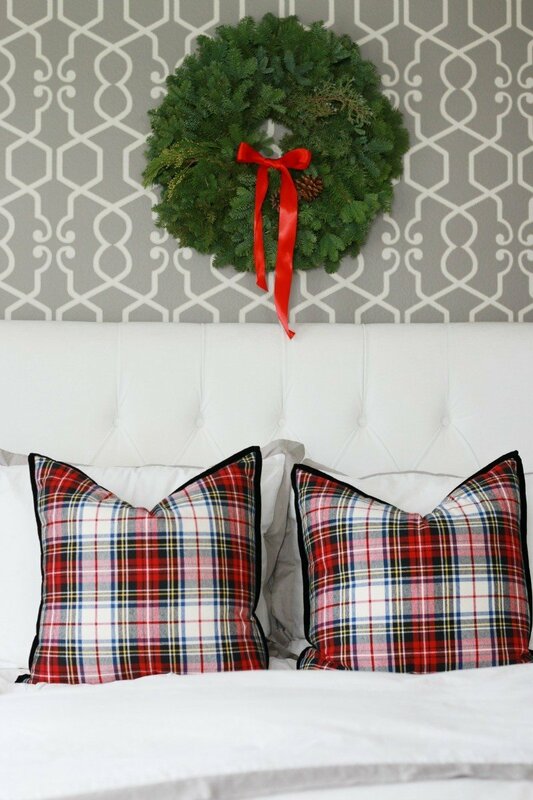 The wreath above the bed and those beautiful plaid pillows give your room the perfect festive touch. 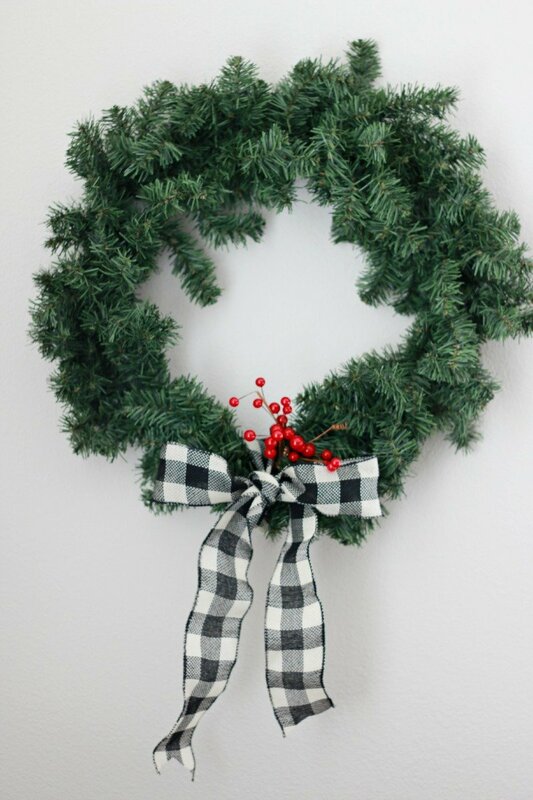 Great tip on refreshing the garland! I need to do that with ours. Ours is looking a bit droopy so thank you for sharing that. It looks SO beautiful! I love the plaid! Beautiful, beautiful, beautiful Courtney! It’s ridiculous how in love with your nightstand I am! Have a great weekend! Beautiful bedroom. The plaid pillows on the white really pop and I love the Noel sign. Such a festive room! The pillows… oh those pillows. 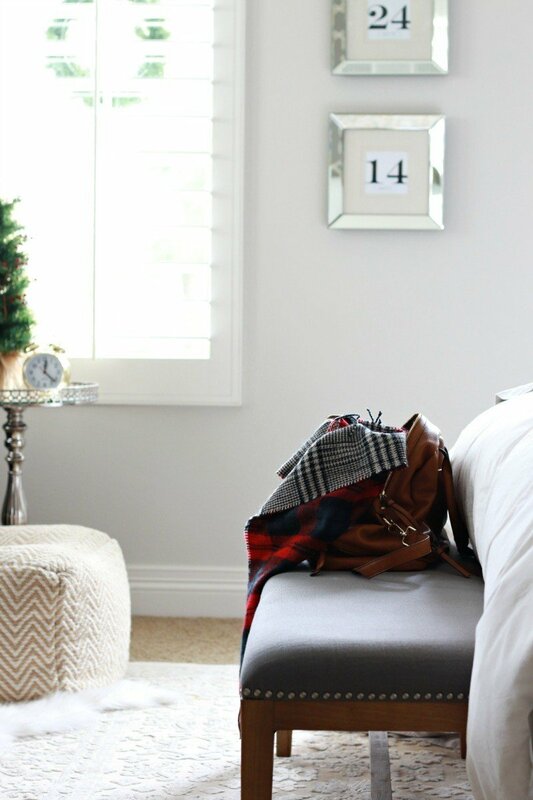 I love that you freshen up your bedroom for the Christmas season. 🙂 One of the many perks for decorating with neutral colors — anything goes! Your room is stunning, I adore the architecture on your bedroom ceiling. Canada does not have a home goods. Hub has agreed to drive me wayyyy south instead of flying so that I can shop and bring items back. Beautiful posts like this are exactly why I have to check out a Home Goods store. This is just beautiful! I love color but I have to admit that the neutral backdrop makes the decorations pop. Love it. Thanks for sharing at Over the Moon. What a cozy guest room! 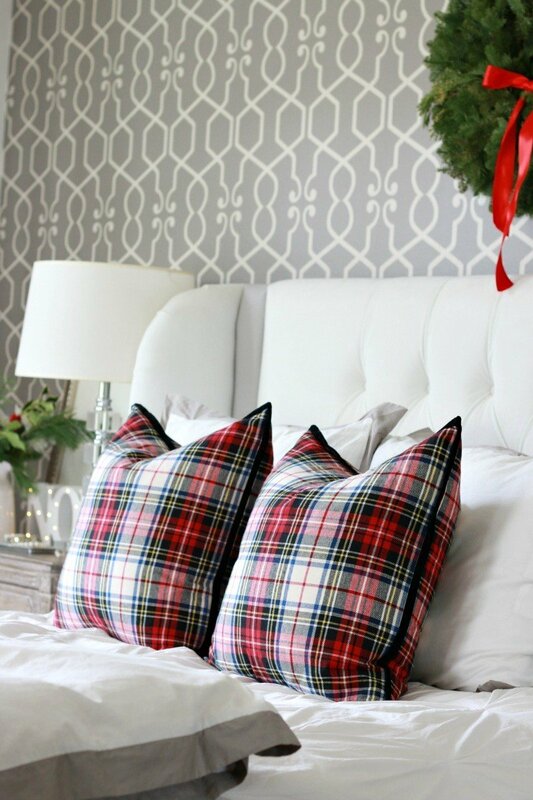 Especially love those plaid pillows! Thanks for sharing at Funtastic Friday!